This is for 10ppm of Angel Chime Moldavite Clear Colloidal water made via low voltage DC electrolysis using an extremely rare Angel Chime Moldavite Crystal from the Czech Republic. 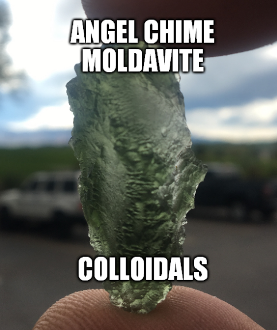 Moldavite is very rare, and Angel Chime Moldavite is extremely rare. The rarest of all (less than one percent) are the "sonorous" Moldavites, called Angel Chimes, which are tempered naturally.The characteristic of this special crystal is that when you strike (gently of course) against metal or ceramic, the sound is a harmonious "ting". Called "The Holy Grail Stone” and “Emeralds Fallen from the Sky,” these natural green crystals are powerful stones for transformation. It is one of the best stones to use for psychic protection, as negative entities find it difficult to connect to your aura when you are wearing it. This stone has a great advantage when you are working with spirit so you can be sure that what you are making contact with is of 'the light'. One of its best assets is that it is a protective stone and especially if you are working on developing psychic abilities. Using this stone in meditation is very powerful. Moldavite is extraterrestrial in nature, as these crystals were formed about 20 million years ago when meteors crashed to the Earth. The impact of the meteorites' hits caused the existing rock material in the Earth to melt and fuse with the meteors, creating a new crystal made of both extraterrestrial and terrestrial material. As a Stone of Connectivity, Moldavite carries an intense frequency, a fusion of earthly and extraterrestrial energies that are quickly felt, often dramatically in those who resonate with its power. Holding Moldavite for the first time often produces a sensation of heat, felt first in the hand, then progressively throughout the body. In some cases the heart chakra is activated, experienced as a pounding pulse, followed by sweating or flushing of the face, and an emotional release that may range from laughter to tears. Moldavite's frequency may take some getting used to, but its profound ability to accelerate one's personal and spiritual evolution makes it highly sought after in the metaphysical world, both for its life-altering capabilities and as a catalyst for drawing in Light to aid in Earth's healing. Moldavite is a member of the Tektite group of natural glasses formed from interplanetary collisions. From the Greek word tektos, meaning "molten," Tektites are glassy mixtures of silicon dioxide, aluminum oxide and other metal oxides with an amorphous crystal structure. Unlike other Tektites from around the world which are tar black or brownish-black, translucent Moldavite is a deep forest green and is the only variety suitable for cutting and faceting as a gem. This beautiful stone is rare, found only in Czechoslovakia, and is named for the area in which it is found, near the Moldau River (called the Vltava in Czech). While scientists differ in theories regarding Moldavite's origin, nearly all agree its formation coincides with the crash of a large meteorite approximately 14.8 million years ago in what is now the Bohemian plateau. The rock metamorphosed by the heat of impact created a strew field of Moldavite in the two, mostly rural, areas of Bohemia and Moravia. Farmers often turned up the stones when plowing their fields, while other specimens worked their way to the surface after spring thaw or heavy rains in the fall. More recently collectors have "mined" for gem grade and museum quality specimens by sifting and digging through loose sands and gravels. The shapes of Moldavite give witness to its molten origins, most commonly drop-like (round to very flattened), plate or disc shaped, oval, spheroid, dumbbell shaped, elliptical, rod-like or spiral, all common in splash patterns of liquids. Moldavites from Bohemian localities are more drop-like, elongated or rod-like, while Moravian stones are more spherical. Moldavite occurs most often in shades of deep forest green, though some are pale green or olive, and others, especially from Moravia, are greenish-brown. The most magnificent of Moldavite's features is the beautifully etched, carved, wrinkled or sculpted patterns inherent in raw and unpolished stones. Pieces found at or near the surface have been subjected to erosion in streams and rivers over the millennia and resemble the rough exterior common to river stones. More finely textured and sculpted specimens are found in sand or gravel pits, and ones found intact and unmarred are considered "museum grade" and are rare and valuable. The rarest of all (less than one percent) are the "sonorous" Moldavites, called Angel Chimes, which are tempered naturally and if dropped on a glass or metal surface "rings" like a coin. Moldavite has a rich history, prized since the Stone Age and used not only for arrowheads and cutting tools, but as a spiritual talisman and amulet of good fortune, fertility and protection. It was found in the archeological site of the Venus of Willendorf, the oldest known Goddess statue, and has been linked to legends of the Holy Grail, thought to be an emerald that fell from the sky out of Lucifer's crown before he was cast from Heaven. In Czech lore, it was given as a betrothal gift to bring harmony to marital relations, and for centuries has been used in jewelry, religious items and for spiritual transformation. Moldavite is relatively fragile and should never be cleansed with salt to avoid scratching its surface. Moldavite is good for counteracting cynicism and connects even the most world-weary adult with the wonders of the universe. It eases away doubts, even when the cause is unknown, and calms worries about money by providing solutions not previously considered. Carrying or wearing Moldavite in jewelry allows its energies to remain in one's vibrational field throughout the day strengthening its effects and increasing the incidents of beneficial synchronicities in daily life. Because of Moldavite's intense vibration, some may experience light-headedness or a lack of grounding and may need to acclimate themselves gradually to wearing it. Moldavite is a useful stone for star children and sensitive souls who find it difficult being in incarnation on the earth, and who cannot adjust to suffering and deep emotions. Placed on the heart, Moldavite uncovers the reasons and purpose for why one is here, and eases the "homesickness" for those whose origin is not Earth. Moldavite works extremely well in combination with other stones, particularly with the crystalline energies of Quartz varieties. It is one of the Synergy Twelve stones, and is ideal for use in making energy tools. Add to wands, headbands, templates, grids and other devices to intensify their effects. Moldavite is a powerful aid for meditation and dream-work, as well as increasing one's sensitivity to guidance, intuition and telepathy, and the ability to understand messages sent from higher realms. Moldavite is useful as a tool for diagnosis, illuminating the cause and source of an imbalance or disease, and then supports the releasing and healing process. Its high vibrational energy helps re-establish the blocked areas, encouraging the cells to return to their original state of perfection. A rejuvenating stone, Moldavite stimulates personal fulfillment and slows down the aging process. It aids in memory retention and protects against mental degeneration. It may help balance disturbances in the electrical impulses of the brain, and is supportive for hard to treat progressive illnesses. It is an excellent stimulant for treating gout, and like many green stones is good for the eyes. It may be beneficial in treating asthma and other diseases of the respiratory tract, allergies or rashes caused by modern chemicals or pollution, and assisting the body in overcoming flu and anemia. Moldavite is a stone of the heart, reaching into the deepest inner self and bringing to the surface that which one most needs to recognize, honor, integrate or release. Its resonance brings the heart into union with the mind, allowing them to work together in partnership. The mind in building its creations looks to the heart to see what is worthwhile, and the heart learns to view the self and others with compassion and empathy. Moldavite is an unconventional stone, inspiring unexpected solutions and awakening latent memories. It assists in releasing archaic belief systems and long-held ideas that no longer serve one's best interests, and has the ability to neutralize hypnotic commands. Those who dislike Moldavite's deep green color often have an aversion to emotion and need to experience unconditional love to find wholeness. They may also have hidden emotional trauma that needs to surface and heal, for which other crystals are required. Moldavite is a talisman sent to Earth for spiritual awakening, transformation and evolutionary growth. It facilitates strong, clear, and direct connection between one's consciousness and the Universal Source. With its own cosmic oversoul, Moldavite has an ability to connect with Ascended Masters and cosmic messengers, and draw into the Earth plane those thought patterns and light vibrations which are most beneficial for ascension and illumination. Another of Moldavite's important properties is its ability to ground Light for the healing of the Earth. It provides an understanding of the essential unity of all life and our responsibility to see our planet as a whole being in need of love and compassion.